Founded in 1902, 3M (MMM) was intended to be a mining company that would find minerals used in sand paper and grinding wheels. While the company wasn’t successful in this initial adventure, the founders’ turned to working with different materials to produce innovative new products for customers in order to grow their business. 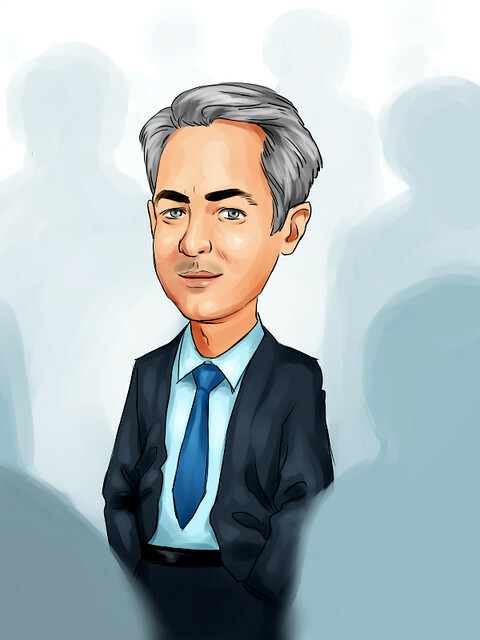 ValueWalk readers can click here to instantly access an exclusive $100 discount on Sure Dividend’s premium online course Invest Like The Best, which contains a case-study-based investigation of how 6 of the world’s best investors beat the market over time. That spirit of innovation lives on as 3M now has a portfolio of more than 60,000 products that are used in homes, offices, hospitals, schools and businesses around the world. 3M employees more than 90,000 people and sells its products in more than 200 countries. 3M has raised its dividend for 60 consecutive years, making the company a Dividend King. You can see all 25 Dividend Kings here. Click here to download my Dividend Kings Excel Spreadsheet now. Keep reading this article to learn more. Click here to access our Members Area where you can easily download all our Excel databases in one place. There are just seven companies that have at least as long of a growth streak as 3M. This article will examine 3M’s business model, growth prospects, recession performance and valuation to see if the stock is worth purchasing right now. 3M is a diversified industrial company. There are five separate business within the company. The Industrial division, which accounted for approximately a third of 2017 revenues and 26% of operating income, has a broad range of products to offer customers. These include appliances, electronics, paper and packaging, tapes, abrasives and adhesives. The Safety & Graphics division produced almost 19% of revenues and 20% of income. This division produces personal protective gear such as hearing and eyewear protection as well as security products that can monitor rescue workers in dangerous environments. The Healthcare division, 19% of revenues and 23% of income, supplies surgical and dental items, drug delivery systems and products that help to prevent disease to its customers around the world. The Electronic & Energy segment of the company provides products that are focused on renewable sources of energy. Some of the product offerings include installation tapes, fibers and circuits. This division produced 16% of revenues and roughly 17% of operating income. The Consumer division is the smallest of the five components of 3M. This division contributed 15% of revenues and 13% of income. Products in this category include office supplies, home improvement products, protective materials and stationary. 3M’s 2017 results show that the industrial heavyweight continues to see all aspects of its business improve. For the fourth quarter of 2017, 3M earned an adjusted $2.10 per share. This topped analysts’ expectations by $0.07 and was almost 12% above Q4 2016’s figure. Revenue grew 9% year over year to $8 billion. This was a beat of estimates by $110 million. Currency exchange actually benefited the company to the tune of almost 3% during the quarter. All divisions of 3M had impressive results. The Industrial segment had strong demand in abrasives, adhesives and tapes as well as in its automotive business. The addition of Scott Safety helped the Safety & Graphics division improve sales 15% year over year. In the Healthcare division, food safety and medical consumables saw strong demand and revenue from the Asia Pacific region grew double digits. Electronics-related sales grew a robust 14%, helping the Electronics & Energy segment produce organic sales growth of 11%. E-commerce was strong for products in the Consumer division, helping the company to see a 7.3% increase in sales and a 17.6% increase in operating income. All of these divisions produced organic growth during the quarter. 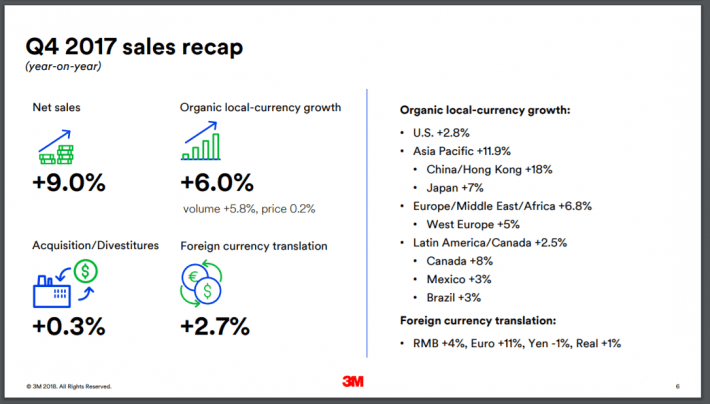 3M didn’t just have a good quarter, it had a good 2017. For the year, 3M earned $9.17 per share, a healthy 12.4% increase from 2016. Revenue for the year totaled $31.67, a 4.2% improvement from the previous year. The company was also very generous to its shareholders, returning almost $5 billion in 2017. 3M’s operating margin of 24.7% for the year is the highest since 2007. 3M is a business that is firing on all cylinders. Management expects that to continue into 2018. In December, management guided towards an EPS for 2018 in the $9.60-$10.00 range. This would be an increase of 6.9% from 2017 based on the midpoint of this guidance. Thanks to tax reform, 3M now forecasts earnings per share between $10.20 and $10.70. At the midpoint of this new guidance, EPS is expected to grow 14% from 2017. Organic sales are expected to increase 3%-5% with currency and acquisitions expected to have a small impact on revenues. As with most companies during the last recession, 3M was not immune to earnings decline. Earnings per share declined year over year in 2008 and 2009. Even these declines were not drastic compared to the rest of the market. In 2010, the company’s earnings really picked up growing more than 24% from the previous year. 3M hasn’t looked back since. The company has managed to grow earnings per share every year since 2009. Since the 2009 lows, 3M has seen its earnings grow an average of 12.9% per year through 2017. Based on the midpoint of 3M’s guidance for EPS, the company is expecting to grow earnings 14% in 2018. 3M isn’t a company that rests on its previous success. 3M has a healthy research and development budget every year that helps to create new products. The company spent $2 billion, or 6% of sales, on research and development in 2017. This expense has been a worthwhile endeavor as 30% of sales during the year came from products that didn’t exist five years ago. 3M also has more than 100,000 patents. Its R&D investments and extensive patent portfolio serve as valuable competitive advantages. 3M has an extremely impressive dividend growth history. There are only a handful of companies that have raised its dividend longer than 3M. Even during the depths of the last recession, the company still managed to increase its dividend. In 2008, 3M gave shareholders a 4.2% raise. The company followed that up with a 2% raise in 2009 and a 6% raise in 2010. While these raises aren’t overly generous, it is still noteworthy that 3M was able to boost its dividend during a time when other companies were cutting theirs. A few more years out from the last recession and 3M has started aggressively hiking its dividend. The average raise over the past 5 years is almost 15%. At the end of January, the company increased its dividend 16.2% for the March payment. Both of these figures are significantly higher than the raises the company gave during the Great Recession. Shares currently yield 2.3%. Earnings per share have been growing at a healthy clip of almost 13%. That growth should continue to accelerate as tax reform allows the company to retain more of its earnings. Even so, the multiple is elevated compared to its historical average and might not have more room to expand. According to ValueLine, 3M is expected to generate earnings-per-share of $9.85 for 2018. As a result, the stock trades for a price-to-earnings ratio of 23.6. This is highly above its average valuation. 3M has held an average price-to-earnings ratio of 17.2 over the past 10 years. 3M stock is currently valued above its 10-year average valuation by approximately 37%. This indicates an overvalued stock, meaning investors could see contraction of the price-to-earnings ratio moving forward. That said, the stock can still generate positive returns, through earnings growth and dividends. Add these up and I think investors can expect to see annual returns of approximately 8% on an annualized basis. 3M is a well-diversified company that has a dividend growth history that few other companies can touch. Shares of 3M are trading above its historical average P/E, but this is warranted based on the company’s earnings growth rate going forward. Shares yield just over 2% at the current price, but investors can take comfort in knowing that the company will continue to raise its dividend each and every year going forward.